Emmanuel Francis (E.F.) Joseph was the first professional African American photographer in the San Francisco Bay Area of California. Born on November 8, 1900 on the Caribbean island of St. Lucia, Joseph would later move to the United States and attend the American School of Photography in Chicago, Illinois. After graduation in 1924, Joseph moved to Oakland, California, where he apprenticed in a photography studio. In the early 1930s, Joseph began his career as a photojournalist. Over his lifetime, he worked for numerous Bay Area newspapers, including the California Voice, The Oakland Post, San Francisco Examiner, and the nationally distributed Pittsburgh Courier from Pennsylvania. Joseph also ran a photography studio initially out of his home in West Oakland. He took photos of babies, children, men, women, couples, and families. He also captured the contours of community life, snapping photos at events held by churches, schools, nightclubs, social clubs, and lodges. Joseph and his first wife, Alyce, who assisted him, were especially active in the East Bay’s African American community. They recorded community events such as etiquette classes and teas at DeFremery Recreation Center, athletic events at local schools, and debutante balls at local halls. During World War II Joseph served as a photographer for the United States Office of War Information. Over the course of the war, Joseph’s camera captured life in the Bay Area’s defense industries. Joseph shot some of the most iconic photos from the period, including many “Rosie Riveters” images and the iconic photo of Lena Horne launching the battleship USS George Carver. Joseph’s camera also caught some of the more dramatic moments of the era, such as the Port Chicago disaster and ensuing trial of the “Port Chicago 50” as well as everyday World War II life in the Bay Area, such as USO dances. In the immediate post-war period, Francis’ camera captured the founding of the United Nations in San Francisco. Joseph also built a thriving commercial photography business. Enterprises of all kinds sought him out to cast their business and product in a favorable light in advertisement. Joseph took pictures of car dealerships, restaurants, flower shops, funeral homes, doughnut shops, and department stores. He photographed everything from canned food items and caskets to automobiles and furniture. After working in newspaper and studio photography for four decades, Joseph retired in the early 1970s. 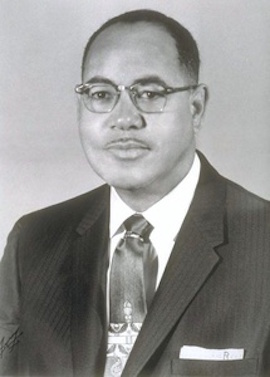 He remained active in the local branch of the National Association for the Advancement of Colored People (NAACP) and the William Anderson Masonic Lodge. He was a lifetime member of the Professional Photographers of America. Emmanuel Francis Joseph died in Oakland, California on September 27, 1979 at the age of 79. African American Museum and Library at Oakland, http://www.oac.cdlib.org/findaid/ark:/13030/c8930w8p/; “Careth Reid Saves Black History Photographs from Destruction,” Oakland Post, May 5, 2012, http://content.postnewsgroup.com/author/admin/page/16/; Lincoln Cushing, “Picturing the workers of Kaiser Permanente,” http://kaiserpermanentehistory.org/latest/picturing-the-workers-of-kaiser-permanente/; Tom Debley, “In Memory of Lena Horne and Launch of the SS George Washington Carver Liberty Ship,” http://kaiserpermanentehistory.org/latest/in-memory-of-lena-horne-launch-of-the-ss-george-washington-carver-liberty-ship/.